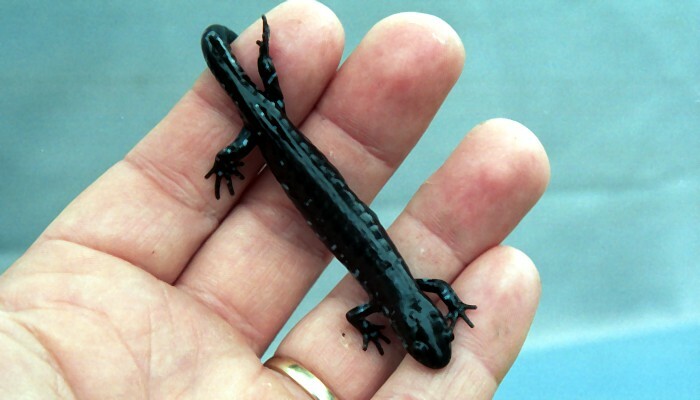 Refer to the Basic Biology page for some general information about salamanders. 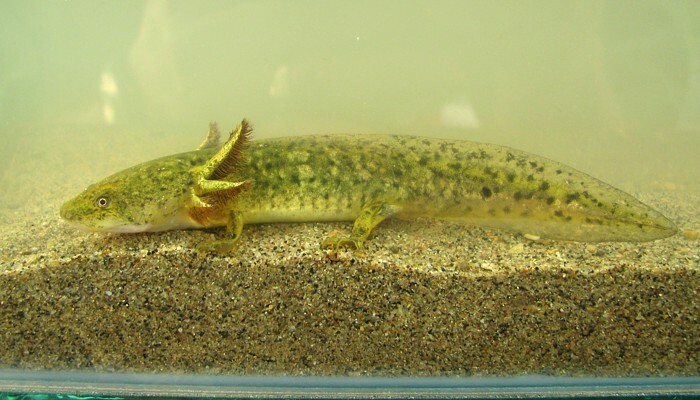 Tiger Salamanders breed in ponds as soon as the edges are free of ice. They can be active above ground at temperatures near 0 C and move around in the ponds where the water temperature is just above freezing. There are four salamander species in Manitoba. Three belong to the family: Ambystomatidae (Blue-spotted Salamander, Barred Tiger Salamander and Eastern Tiger Salamander). These are terrestrial species. 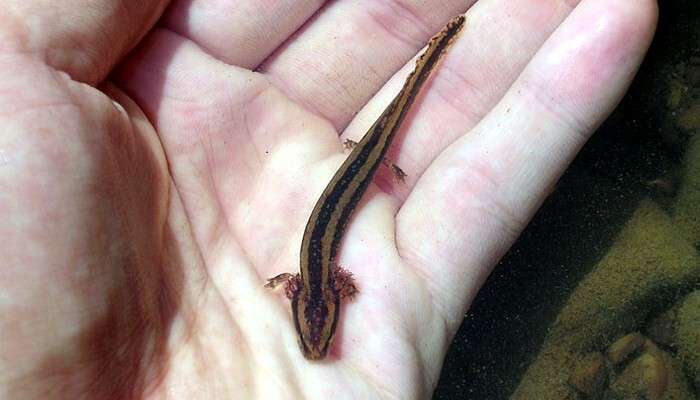 Our fourth salamander belongs to the Proteidae (Mudpuppy). It is an entirely aquatic species. The distributions of all Manitoba's salamanders are not well defined. Current conservation rankings by the Manitoba Conservation Data Centre are included here. For explanations of the ranking terminology: Click Here. 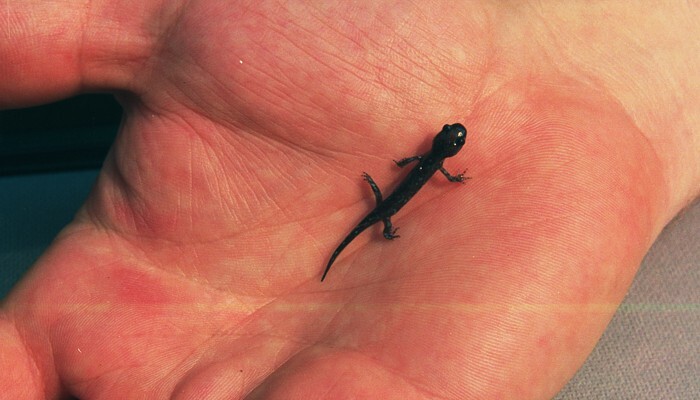 Description: A small salamander, to 13 cm total length, including tail. Colour is dark gray to black with light blue spots or blotches on the side. Belly is lighter in colour. Habitat: Moist woodlands and wetland edges. 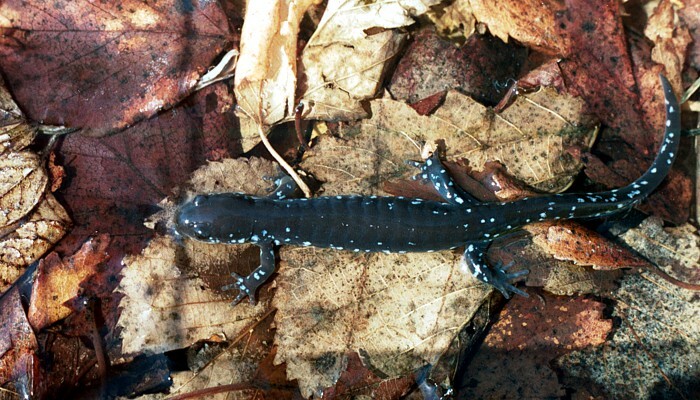 Status and Range in Manitoba: The Blue-spotted Salamander is thought to be quite common in eastern Manitoba (S3/S4). They occur from the southeast corner of the province westward to the Brokenhead River, northwards into the Interlake on the west side of Lake Winnipeg, and on the east side of the lake northward along the lower basin of the lake. Current Range Map for the Blue-spotted Salamander. Tips on finding this species: In spring look for adults in ponds where Wood Frogs breed. Wood frogs are the earliest of the frogs to breed and salamanders move to the ponds about the same time. 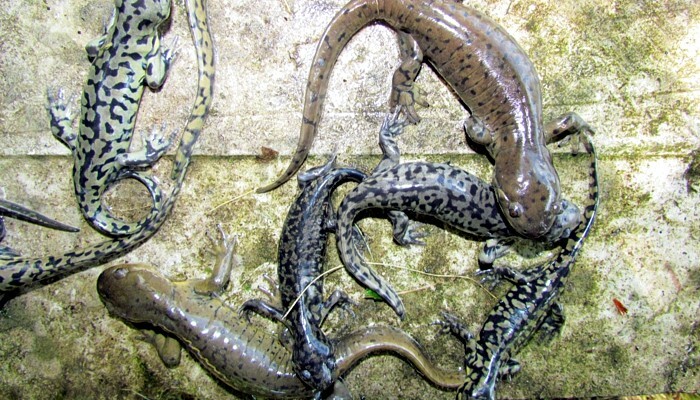 At night with the aid of a flashlight salamanders can be seen on the bottom of the pond. They will not be visible during the day. 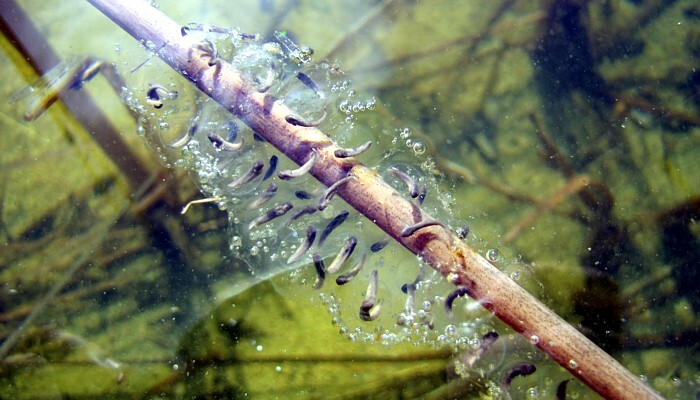 Later on, ponds can be surveyed for developing larvae. These are distinct from tadpoles as they are more slender, have visible external gills and in later stages all four limbs will be apparent. For the rest of the snow-free season Blue-spotted Salamanders can occasionally be found in moist woodlands by looking under logs, rocks or debris left by humans. In winter individuals have been found in basements, presumably entering through foundation cracks. See NatureNorth.com article: Blue-spotted Salamander for more on this species. 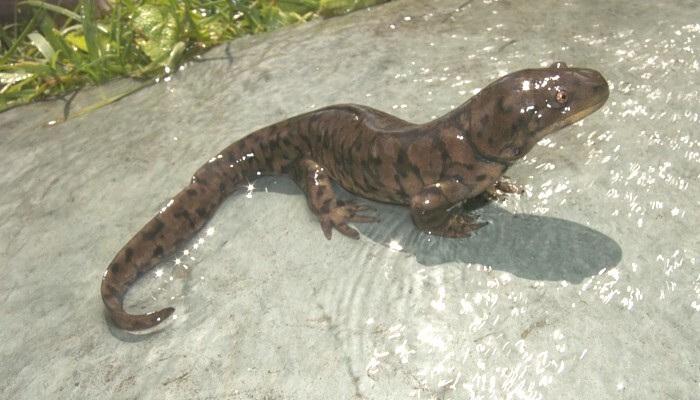 Description: A large salamander, to 33 cm total length, including tail. Colour is variable from gray to dark olive green with darker stripes, bars or blotches. Pattern of the bars or blotches is highly variable. Belly is lighter in colour. Habitat: Moist grasslands or woodlands near wetlands. 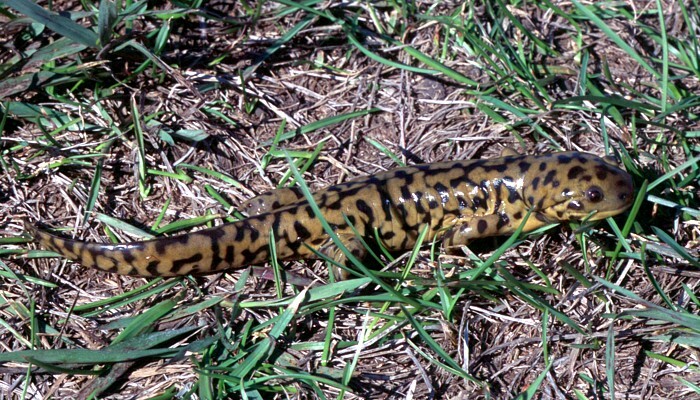 Status and Range in Manitoba: The Barred Tiger Salamander is common in southwestern Manitoba (S4/S5) west of the Red River, especially in the Prairie Potholes region where the larger ponds afford them excellent breeding habitat. Current Range Map for the Barred Tiger Salamander. Tips on finding this species: In spring look for adults in and around ponds right after the ice melts, from late March to mid-April. By the time Wood Frogs are starting to call Tiger Salamanders will be breeding. Search the bottom of ponds with a flashlight after dark. They will not be visible during the day. Later on, ponds can be surveyed for developing larvae. 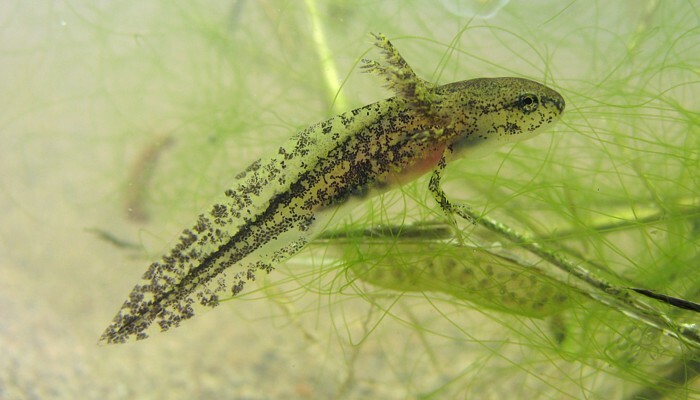 These are distinct from tadpoles as they are more slender, have visible external gills and in later stages all four limbs will be apparent. Newly transformed adults occasionally may be seen in great numbers some evenings or at night around the end of August, leaving large ponds en masse. Keep an eye out around the Labour Day Long Weekend for mass emergences. 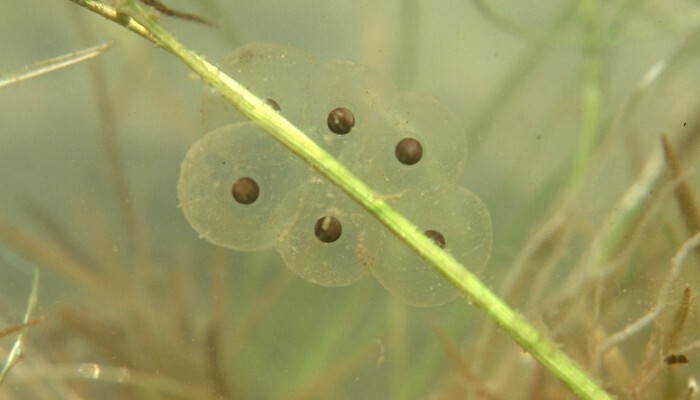 Whether these are young from eggs in spring or the result of larvae that have lived for several years is not known. For the rest of the snow-free season Barred Tiger Salamanders are very elusive remaining underground or burrowing in the leaf litter or humus layer. Check in moist habitats under logs, rocks or debris left by humans. 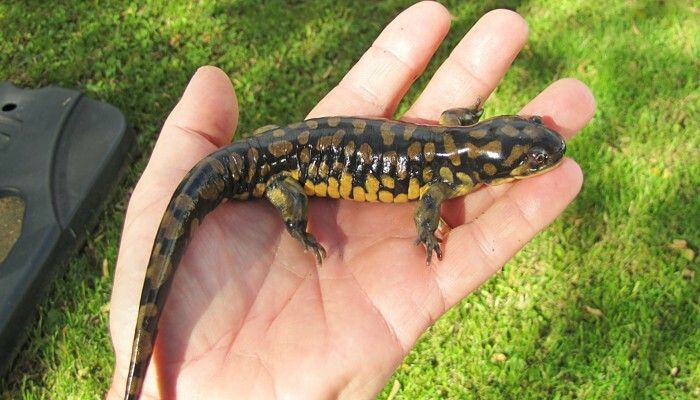 Special Note: The Eastern and Barred Tiger Salamanders were until recently considered to be subspecies of Tiger Salamander. 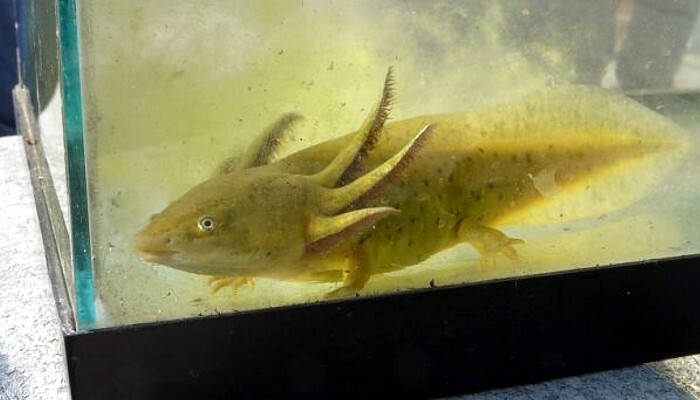 Other than their descriptions there is as yet little information on differences in their biology, so please refer to the Barred Tiger Salamander account. 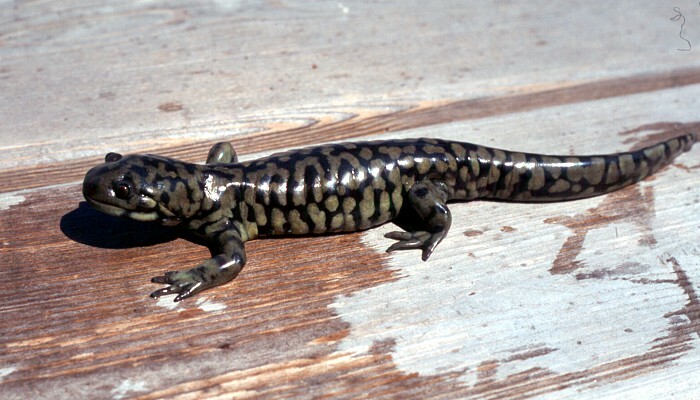 Description: A large salamander, to 33 cm total length, including tail. Colour is variable, from dark gray to almost black with cream to yellow coloured bars, blotches or distinct spots. Belly is lighter in colour. 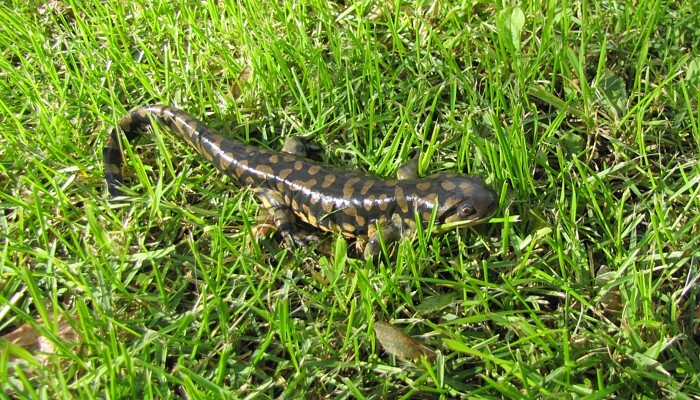 Status and Range in Manitoba: The Eastern Tiger Salamander in considered uncommon in Manitoba (S2). They are thought to occur in a small region of southern Manitoba from the Red River eastward to the edge of the boreal forest and northward perhaps to the south end of Lake Winnipeg. Current Range Map for the Eastern Tiger Salamander. Tips on finding this species: As above. 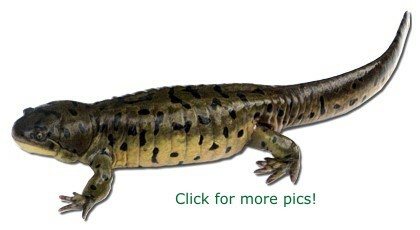 Description: A large salamander, to 50 cm total length, including tail. Colour is rusty brown to gray with darker or bluish spots or blotches. Bushy, red external gills will be present as will a prominent tail fin. This is a wholly aquatic species. Habitat: Lakes, rivers, streams. Most often found in areas with a rocky bottom. 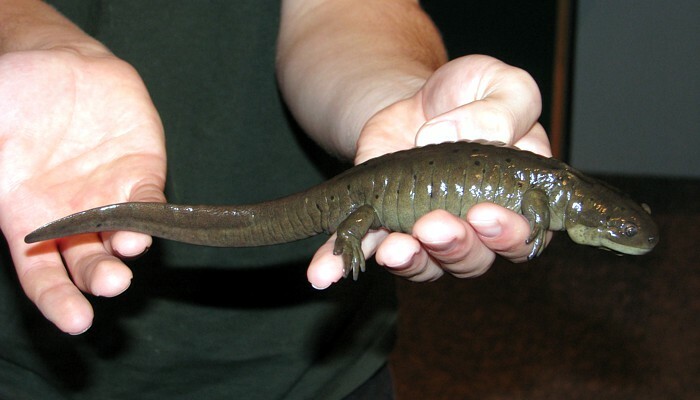 Status and Range in Manitoba: The Common Mudpuppy is likely common, at least in southeastern Manitoba (S3/S4). It is found in lakes and rivers from the southeast corner of the province at least as far north as the southern basin of Lake Winnipeg. It occurs in the Red River and in the Assiniboine River at least as far west as Brandon. Current Range Map for the Common Mudpuppy. Life Cycle: Mudpuppies mate in autumn, but females do not lay eggs until late spring or early summer. The female constructs a nest by hollowing out below a rock or submerged log then deposits her eggs onto the underside of the rock or log. The eggs hatch 6-10 weeks later. 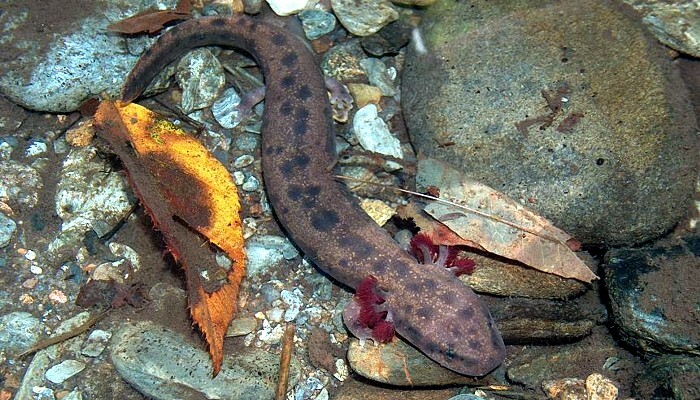 Tips on finding this species: Looking under rocks in large streams or rivers may be one way to find a Mudpuppy. Investigating clear stream bottoms at night with a strong flashlight may reveal these nocturnal creatures. 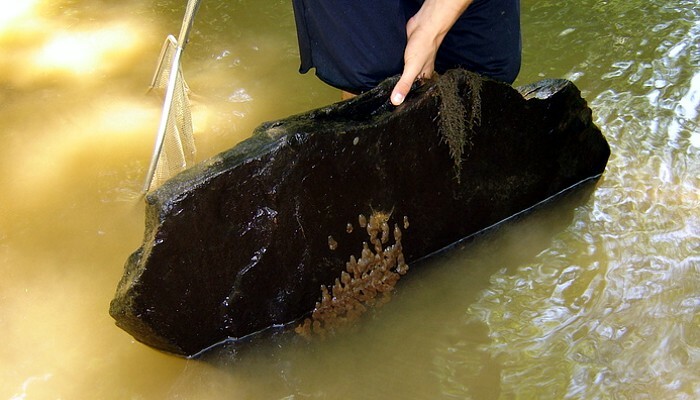 Seine or dip nets may be useful to catch mudpuppies. Large minnow traps baited with meat of some sort have been used to capture specimens, too.